Want a quick look at Guardians of the Galaxy 2? Obviously. Marvel Entertainment just released this new sneak peek teaser for the rebellious sci-fi sequel and everyone is looking good - including Yondu and Nebula, who look like they'll have more benevolent (or at least less antagonistic) roles than they did in the first adventure. This trailer arrived within hours of director James Gunn sharing the first poster for the film, which also features Yondu and Nebula. It makes sense - the crew is going to need more muscle with Groot reduced to "fun size". Though clearly they can never replace the down-home wisdom of Drax the Destroyer. If this short teaser trailer just wasn't enough for you, make sure you check out our breakdown of the full-length trailer shown at San Diego Comic Con this year. 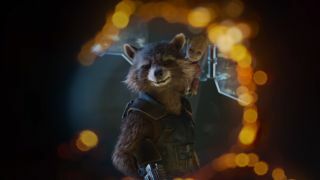 Directed by James Gunn and starring Chris Pratt, Zoe Saldana, Dave Bautista, Karen Gillan, Michael Rooker, Kurt Russell, Bradley Cooper, and Vin Diesel, Guardians of the Galaxy Vol. 2 will hit UK cinemas on April 28, 2017 and open in US theaters on May 5, 2017.